South Mimms set up a workhouse in around 1724. A parliamentary report of 1777 recorded parish workhouses in operation at Chipping Barnet (for up to 25 inmates), Finchley (18), Ridge (40), and South Mimms (55). The parish officers wholly refuse to give any information respecting the Poor or assessments, but from information supplied it appears that the Poor are farmed at £23 a month and that the Poor's Rate is generally from 2s. to 2s.6d. in the pound. If this account is correct, farming the Poor keeps down the rates. Further parish workhouses were built in Shenley (1800, for 40 inmates), Chipping Barnet (1807, 45 inmates), East Barnet (1820, for 50 inmates), and Ridge (1834, for 20 inmates). County of Hertford: Chipping Barnet (3), East Barnet, Elstree, Ridge, Shenley (2), Totteridge. County of Middlesex: South Mimms (2), Hadley (2), Friern Barnet. Finchley was added to the Union on 16th May 1836. The population falling within the enlarged Union at the 1831 census had been 12,180 with parishes ranging in size from Elstree (population 341) to Finchley (3,210). The average annual poor-rate expenditure for the period 1832-34 had been £6,983 or 11s.6d. per head of the population. The new Barnet Board of Guardians had its first meeting on 6th July 1835 and appointed a workhouse committee. 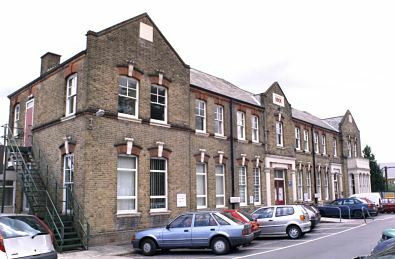 Initially, there was some debate about whether to make use of the existing Chipping Barnet workhouse, or to build a new establishment. On 29th July, advertisements were placed for a suitable site for a workhouse in Barnet. Model designs were also requested from the Poor Law Commissioners. In September 1835, the Guardians received a letter from their Clerk WN Franklyn extolling the virtues of plans by John Griffin for a workhouse at nearby Hemel Hempstead. Griffin was also responsible for the workhouse at St Albans. In October 1835, the Barnet Guardians appointed Griffin as architect to draw up plans for their new workhouse. 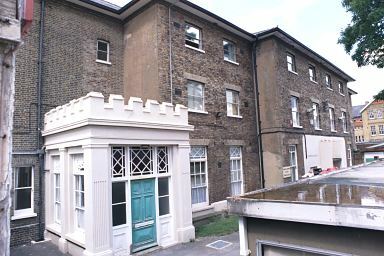 The Barnet Union workhouse was built in 1836-7 at the end of West End Lane and at the south side of Well House Lane. The main building, backing on to Well House Lane, had a T-shaped layout with deep wings containing back-to-back wards. A variety of sheds, workshops and wash-houses formed the outer perimeter to the south and north. An early plan shows the disposition of the ground floor rooms and yards. Barnet main block from the south-west, 2001. Barnet rear of main block from north-east, 2001. Barnet general view from the north-west, 2001. The layout of the site in 1896 is shown on the OS map below. Additional infirmary blocks were added at the east of the workhouse in 1886, and to the south 1901. Barnet 1886 infirmary from the south, 2001. Barnet 1901 infirmary from the north, 2001. A chapel was added at the south-west of the workhouse, probably in the 1920s. The site was taken over for use as a military hospital during the First World War. 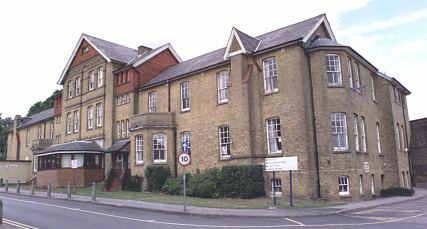 The site now serves as Barnet General Hospital. Barnet workhouse is said to have been the inspiration for the workhouse in the Charles Dickens novel Oliver Twist after a friend of his paid a visit to the establishment and heard one its young inmates "ask for more". 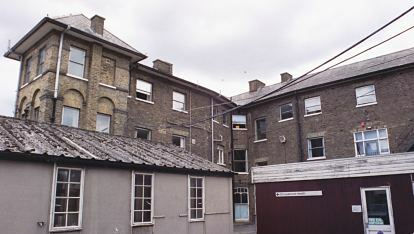 In 2002, the hospital authorities announced plans to demolish the workhouse and to use the site as a car park. The destruction of this historic building has now taken place. 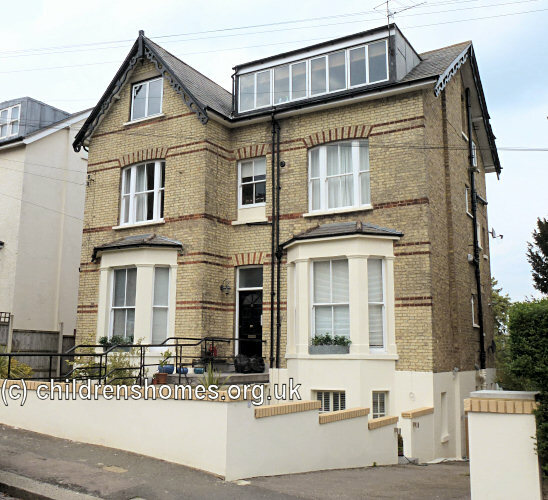 By 1924, the Barnet Union was operating children's scattered homes at 'Guyscliffe', 27 High Street, Barnet, which had 34 places, and at 'Moray House', Victoria Road, New Barnet, 14 places. By 1929, Moray House had been replaced by 'Rosendale', 18 King Edward Road, New Barnet, with 22 places. 18 King Edward Road, New Barnet, 2013. Hertfordshire Archives and Local Studies, County Hall, Pegs Lane, Hertford SG13 8DE. Holdings include Guardians' minute books (1835-1930); Register of paupers placed in service (1836-79); Master's reports (1836-8, 1852-63); etc. Gear, G (ed) Diary of Benjamin Woodock, Master of Barnet Union Workhouse, 1836-1838. (2010) Hertfordshire Record Society. Benjamin Woodcock's Diary is a unique insight into the running of an early union workhouse, the views and actions of the master, and of the Guardians and the paupers. Includes extracts from the admission and discharge register, a set of accounts, details of paupers found work by the Guardians etc. The diary covers the especially interesting years between the formation of the Barnet union and the opening of its new workhouse. Published 2010 by Hertfordshire Record Society. ISBN:9780954756178. Hardback, xlii+277 pages, 16 illustrations. Price £22 (+£3.50 P&P). More details and order form.